Forces Engaged: [C] Four infantry divisions (Gordon, Rodes, Ramseur, and Breckinridge/Wharton), four brigades of cavalry, and artillery, totaling about 13,000; [U] Three infantry divisions (Thoburn, Duval, and Mulligan), two cavalry divisions (Averell and Duffi), and three batteries of artillery, numbering about 10,000. Significance: In late June and early July 1864, Lt. Gen. Jubal A. 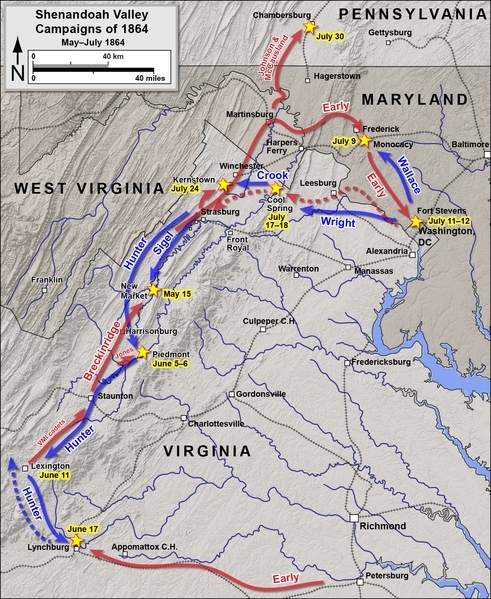 Early's Confederate army used the strategic Shenandoah Valley corridor to terrorize Maryland, defeat a Union army at Monocacy, and march on Washington, D.C. Only the diversion of reinforcements from the Army of the Potomac, bogged down in the trenches before Petersburg, turned back the invasion. Early returned to the Valley and achieved a decisive victory over George Crook's command at Second Kernstown on 24 July. He subsequently sent cavalry to burn Chambersburg, Pennsylvania on 30 July. These disasters forced Lt. Gen. U.S. Grant to take immediate action to solve the Valley problem. The VI Corps and elements of the XIX Corps were returned to the Valley and united with Crook's corps (called the Army of West Virginia). Additional cavalry units were diverted to the Valley. More importantly, Grant unified the various military districts of the region into the Middle Military District and appointed Maj. Gen. Philip Sheridan as overall commander. Sheridan took command of the newly christened Army of the Shenandoah on 7 August at Harpers Ferry. Sheridan's leadership and his strongly reinforced army turned the tide against Confederate power in the Shenandoah Valley. County: Frederick, VA and City of Winchester General Location: US 11 (Valley Pike) and Hoge Run; Old Opequon Church is approximate center of the field; Pritchard's Hill. Phase One. Skirmishing at Kernstown (23 July): On the afternoon of 23 July 1864, CS cavalry advanced aggressively down the Valley Pike, driving US cavalry from Newtown (Stephens City) to Kernstown. Brig. Gen. George Crook directed Duval's infantry division to deploy across the pike and clear the town of Confederates, which they did with little difficulty. Crook then withdrew his infantry to Winchester behind Abrams Creek, leaving a brigade of cavalry to picket Kernstown. The CS army encamped in the vicinity of Strasburg with headquarters at the Kendricks' House: Ramseur at Capon Grade, Rodes at Fisher's Mill, Wharton and Gordon on Hupp's Hill. The CS cavalry withdrew to the vicinity of Newtown. Phase Two. Advance of CS Infantry (24 July): At first light, the CS infantry left their encampments near Strasburg and advanced down the Valley Pike. At Bartonsville, Ramseur's division was directed west on side roads to the Middle Road. Gordon, Wharton, and Rodes continued ahead on the pike. Early sent two columns of cavalry to the east and west on a wide- ranging maneuver to converge on Winchester and the Federal rear. Cavalry led the advance down the pike, coming up against the main US force at Kernstown about 1000 hours. 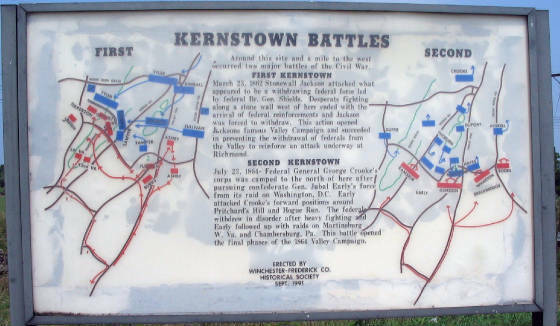 About noon, the vanguard of the CS infantry reached Kernstown. Gordon deployed to the left of the Valley Pike, Wharton to the right. Ramseur deployed across the Middle Road at Mrs. Massie's house. Rodes moved east from the Pike, following a ravine. Phase Three. US Deployment on Pritchard's Hill: Crook received information that Early's army was approaching and brought two of his three divisions into line just north of Hoge's Run at Kernstown. Mulligan's division held the US center behind a stone fence at the Pritchard House, supported by Capt. Henry DuPont's artillery massed on Pritchard's Hill to his rear. Duval's two brigades were separated and posted on Mulligan's flanks with Hayes' brigade extending the US line east of the Valley Pike. A strong skirmish line was posted near Opequon Church. Thoburn's division was held in reserve on Pritchard's Hill to the right rear of the main US line. Cavalry protected both flanks. Phase Four. CS Attack on Center: About noon, Gordon's division advanced in line west of the pike, driving back the skirmishers and closing with the main US line in the vicinity of Opequon Church. Mulligan's division counterattacked, supported by Hayes on his left and took possession of the churchyard. Soldiers sheltered there from the intense firing behind stone fences and headstones in the cemetery. Gordon regrouped and again advanced, compelling Mulligan to fall back 250 yards to the stone fence along Pritchard's Lane. Gordon reached Opequon Church but could make no further headway. CS artillery was brought up south of the church to engage US artillery on Pritchard's Hill. One of Wharton's brigades came into line on Gordon's right. Crook repositioned his forces. Duval's right flank brigade was moved west, astride Middle Road. Thoburn's division was brought forward to fill the gap between Mulligan and Duval. Elements of Duffi‚'s cavalry supported the right flank on the Middle Road and picketed Cedar Creek Grade to the west. Phase Five. CS Attack on Left: Ramseur's division came into line from the Middle Road on Gordon's left and advanced. Gordon shifted a brigade to the open ground west of Opequon Church and advanced against Thoburn in conjunction with Ramseur. Without orders Gordon's brigade attacked and dislodged US troops sheltering behind two stone fences. Thoburn withdrew to the base of Pritchard's Hill, bending his line back to the north and exposing Mulligan's right flank. Ramseur advanced in force, wheeling right to confront Thoburn's line and bringing a heavy enfilade fire against Mulligan's line. Phase Six. 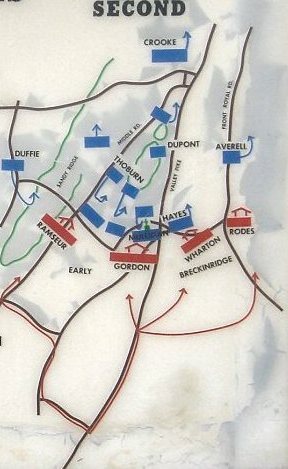 CS Attack on Right: Wharton's division moved along the ridge east of the Pike to threaten the US left flank held by Hayes. Elements of Averell's cavalry division were in position to delay this maneuver but withdrew without engaging. In conjunction with Ramseur's advance on the CS left, Wharton attacked about 1500 hours and quickly turned the US left. Hayes retreated to the stone walls that lined the Valley Pike and rallied his brigade, facing east at right angles to the center held by Mulligan. Phase Seven. US Retreat: Three CS divisions now moved in concert to envelope the US center. 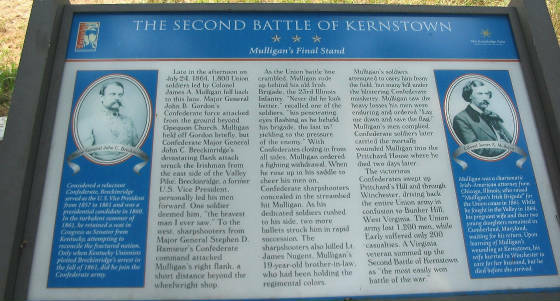 Mulligan's division was under fire from three directions. While trying to direct the defense, Mulligan himself was pierced by five mini‚ balls and fell mortally wounded. ``Lay me down and save the colors!'' he snapped at the officers who tried to assist him. The US center collapsed, and soldiers began streaming to the rear. Hayes' brigade stood long enough on the crest of Pritchard's Hill to allow the US artillery to escape. Elements of Duffi‚'s cavalry made a brief counterattack along the Middle Road, buying time for Thoburn's division to retire in relatively good order. Phase Eight. Rear Guard Actions: A brigade of Thoburn's division made a stand near the toll gate at the intersection of the Valley Pike and Cedar Creek Grade, while the rest of Crook's infantry retreated through the streets of Winchester. Rodes' division, in the meantime, crossed from the Valley Pike to the Front Royal Road and marched north to cut off the Federal retreat, meeting only light opposition from the US cavalry. Rodes followed the Federal forces north to Stephenson's Depot, taking hundreds of prisoners until darkness ended the pursuit. The CS cavalry did not advance as Early expected. The disorganized Federal army retreated to Bunker Hill where it regrouped. Crook continued the retreat before dawn and eventually reached the Potomac River on 27 July. For a few days after the battle, Federal prisoners were held in Star Fort. Aftermath: The victory marked the high-water point for the Confederacy in the Valley in 1864. Crook's broken army retreated to the Potomac River and crossed near Williamsport, Maryland, on July 26. With the Shenandoah Valley clear of Union forces, Early launched a raid into northern territory, the last made by a substantial Confederate force during the war, burning Chambersburg, Pennsylvania as retribution for David Hunter's burning of civilian houses and farms earlier in the campaign. (Hunter had also burned the Virginia Military Institute in Lexington, but Early's orders to his cavalry under John McCausland did not mention this as a justification.) They also attacked Union garrisons protecting the Baltimore and Ohio Railroad near Cumberland, Maryland. As a result of this defeat and McCausland's burning of Chambersburg on July 30, Grant returned the VI and XIX Corps to the Valley and appointed Maj. Gen. Philip Sheridan as commander of Union forces there, turning the tide once and for all against the Confederates in the Valley. The core of the battlefield, the US center and goal of decisive CS assaults, is Pritchard's Hill and the Pritchard Farm, owned by the Charles Hardy Grim Estate. The ``Pritchard-Grim'' property (roughly from rte. 652 to Pritchard's Hill and from rte. 628 to the historic Opequon Church, about 200 acres) is agricultural land that retains a marked similarity to its Civil War appearance. The property features a fine brick antebellum structure (Pritchard House), a frame tenant house, and several outbuildings that date from the time of the battle. Col. James Mulligan, commander of the Union center, was wounded in front of and died in the Pritchard House two days after the battle. The stone fence defended by Mulligan's infantry still runs along Pritchard's Lane. CS forces attacked across the open meadow south of the house. Pritchard's Hill served as a Union artillery strongpoint and was assaulted directly during the battle's closing phases. Opequon Church was the focal point of initial fighting; the original building was destroyed during the war but rebuilt in 1896. Union accounts describe firing from behind tombstones in the cemetery. An adjacent parcel (bounded by rte. 37, Cedar Creek Grade, and Middle Road to the Winchester city limits) is primarily agricultural with some new residences along Middle Road and Cedar Creek Grade. This land, about 275 acres, was significant during First Kernstown, and was the location of the US far right at Second Kernstown, anchored on Sand Ridge until turned by Ramseur's advance. Of about 2,200 acres of battlefield core, excluding Rodes' pursuit and cavalry actions, an estimated 625 acres of contiguous open ground remains. Ramseur's deployment area on Middle Road is bisected by the four- lane rte. 37-bypass. Gordon's deployment area is occupied by an industrial building and a housing subdivision. The area where Wharton made his decisive flanking movement and attack Rutherford B. Hayes' brigade is occupied by a high density industrial park along US 11 and the railroad corridor. Dense industrial and commercial development characterizes the land adjacent to and east of US 11. The Pritchard-Grim property and Pritchard's Hill are the last portions of open ground south of the Winchester city limits. Most historic buildings of old Kernstown have been lost, with the notable exception of Hoge's Ordinary or Beemer's Tavern, which has been renovated into office space and anchors a five-acre office-commercial development. Taylor provides a useful drawing of this structure in his sketchbook. The Frederick County Historical Society has recently erected new interpretive signs and a map adjacent to Opequon Church, making the action more comprehensible to visitors. Land east of US 11 (Valley Pike) along the railroad tracks has been developed for a large-scale industrial/business park. Route 11 is zoned commercial/industrial and has been densely developed from south of Kernstown to the Winchester city limits, causing concern over potential development plans west of the highway. A new business/office park was recently constructed near the entrance to the Opequon Church with Hoge's Ordinary as its center piece. A county planning official noted, however, that watershed and ground water considerations make development in the Pritchard's Hill and Sand Ridge areas less desirable. These factors would need to be considered before any development plans would be approved. Residential development is encroaching on the northern part of Pritchard's Hill. For the present, a large portion of this land remains in private ownership and has been altered little since the Civil War. The Pritchard-Grim farm and adjacent portions of Pritchard's Hill are owned by the Charles Hardy Grim Estate. 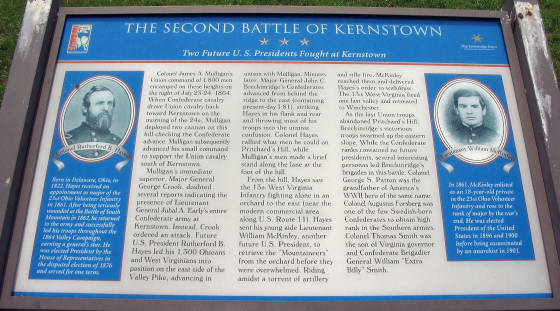 Advance to: Second Battle of Kernstown and Shenandoah Valley and the American Civil War. The following Union Army units and commanders fought in the Second Battle of Kernstown in the American Civil War, on July 24, 1864 in Kernstown, now part of the City of Winchester, Virginia. The following Confederate States Army units and commanders fought in the Second Battle of Kernstown in the American Civil War, on July 24, 1864 in Kernstown, now part of the City of Winchester, Virginia. Breckinridge commanded the First and Second Divisions of the Army of the Valley, while the others reported directly to Early. Since the Valley District was itself the Second Corps of the Army of Northern Virginia it is inaccurate to refer to these two divisions as a "corps", however, much of it functioned like one. Sources: National Park Service; Patchan, Scott C. Shenandoah Summer: The 1864 Valley Campaign. University of Nebraska Press; Lincoln, Ne. 2007; Official Records of the Union and Confederate Armies; Kernstown Battlefield Association; National Archives; Library of Congress.